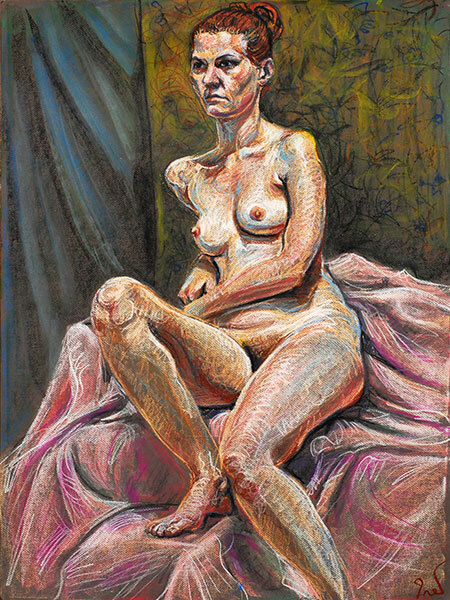 The term “figure study” seems calculated to evoke pedagogical sobriety absent any whiff of lasciviousness. Even the word “figure” suggests cogitation rather than concupiscence. 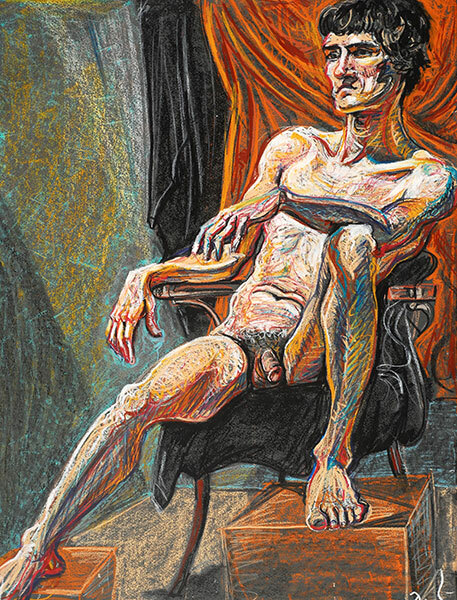 Representational artists have long found contemplation and analysis of the human body to be both an invaluable skill-building practice and a source of inspiration, but in the imagination of the general public all artists are roués and their models are not simply “undraped” but downright nekkid. 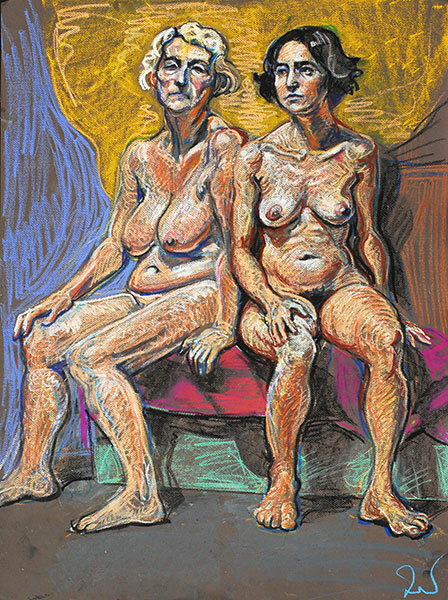 Those who are actually familiar with the practice drawing from life know that a room full of artists focused on the model is often suffused with a meditative intensity more like the atmosphere of a monastery than that of a brothel. For fifteen years I have served as the monitor (supervisor) of a three-hour weekly class at New York’s Spring Studio. We do a set of quick poses to get the energy flowing for both model and artists, and then a single long pose for the rest of the session. Minus the breaks, we have about two solid hours to study and draw a single pose. I’ve featured many drawings from those sessions in various posts on this blog. Sometimes I work on the portrait, other times I concern myself with the subtleties of color and light or the complexities of foreshortening. 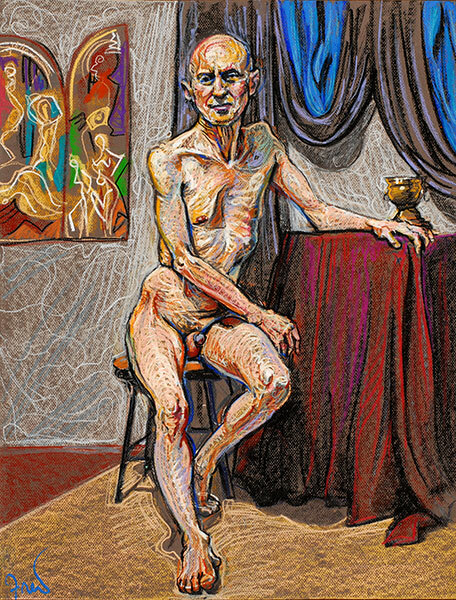 In this post I’ll feature drawings from the Spring Studio long pose sessions that come as close as I ever come to the ideals of traditional academic figure drawing practice. The academic approach to figure drawing generally demands that the entire figure be scaled to fit the page. Artists may use a variety of measuring aids, such as a plumb line or a viewing grid, and use special techniques to establish accurate relationships, often spending more time in measuring and mapping than they do in actually drawing. Some artists who work this way attend the long pose classes at spring studio. They usually use graphite sharpened to a needle-fine point and work very carefully. They’ve often been schooled in the techniques taught by Charles Bargue and Jean-Léon Gérôme, where students start their studies drawing from plaster casts of classical sculpture before graduating to the live figure. Some of Bargue’s own drawings are particularly beautiful, and many other artists use these techniques to wonderful effect, although the danger always seems to be that the live model comes out in the drawings looking like a plaster cast. If you’re familiar with my work, you’ll know that this traditional academic method is quite far from my way of working. For me it would be painfully slow and timid. I do some measuring when I’m drawing, but more for checking and correcting rather than initial construction. As a self-taught artist, I prefer to work as quickly, spontaneously, and boldly as possible. It’s certainly not the appropriate way for everyone to draw, but for me it’s how I get the feeling of aliveness into the work. 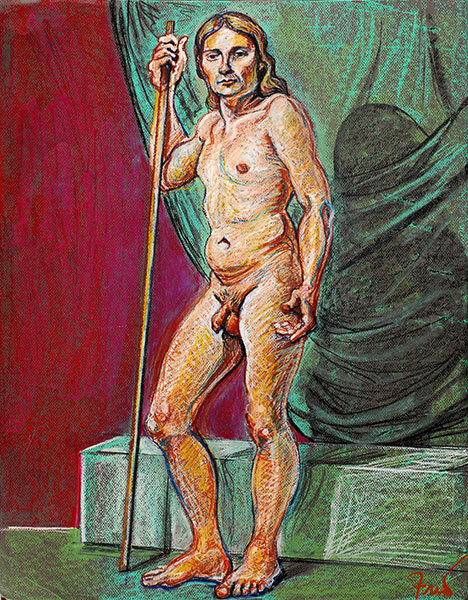 So these aren’t really “academic figure studies” at all. They are, however, drawings in which I have striven to depict, as accurately as I can, the reality of the model on the posing stand. This includes the individual characteristics of the models and the way their bodies rest on or around the various boxes and bits of furniture and fabric that make up the completely artificial environment in which they are placed for our observation. Two models posing together lets us see the body in relation to another body, with all its differences and similarities. The models for the drawing above were a mother and daughter. It is rare in the open drawing long pose sessions that we get to study the back. The back is just as complex as the front of the torso, but its defining points are much more subtle and therefore more challenging to draw. The drawing above is of Claudia, the great model-blogger behind Museworthy. For the drawing above, I was sitting on one side of the model’s platform in Spring Studio’s horseshoe-shaped arrangement. I’ve included a very rough representation of the other artists on the opposite side of the room. Standing poses are often considered the simplest and most basic poses for drawing, because they generally lack foreshortening and tricky juxtapositions. I find them challenging, though, first because the tall and narrow standing body doesn’t fit well within the moderate rectangle of the drawing paper. I find it hard to make myself draw so small, and I have a tendency to make the head too big because it’s hard to get the needed detail in such a small area. Seated and reclining poses come more naturally to me, but every pose presents its own special challenges. The boxes and fabrics and objects around the model become part of the composition, but they also create a set of geometrical relationships that can help the artist to analyze the scene and establish proportions. For me, the reason to understand the anatomical structure of the body is not to be able to alter the figure to more closely resemble an ideal, but to better appreciate the range of variations on every part of the form that makes each figure unique. On most of the drawings featured in this post I’ve remained fairly faithful to the actual background objects on the model’s platform, though I’ve often simplified them and altered the colors to please my own sense of composition and color harmony. I’ll close with another dual-model pose. These men are not related as were the mother and daughter seen in the other two-model drawing here, but they had a great rapport. Both of them look like they belong in the 19th century! The younger model is the same James seen in the fourth image in this post. All of these drawings are 18″ x 24″ or close to that size, aquarelle crayon on paper. 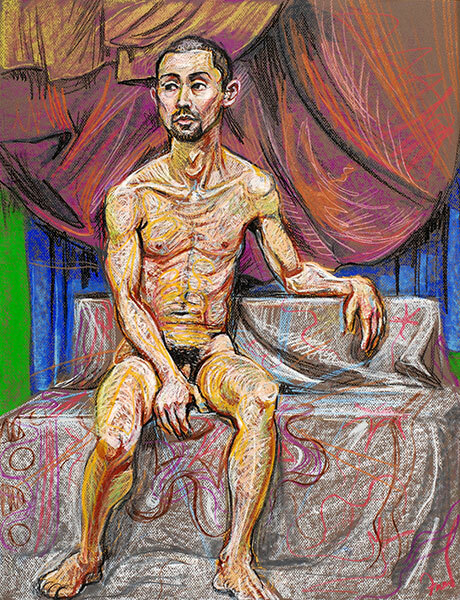 All were drawn at Spring Studio’s Monday morning long pose sessions.